Remington Stalker Hide Insulated Pants. Photo by Chuck Hawks. A couple of months ago I purchased and reviewed a Remington brand Stalker Hide 4-in-1 camo parka. Now, through the good offices of my friends at Remington, I have been sent the matching #18703BU Stalker Hide insulated pants for review. 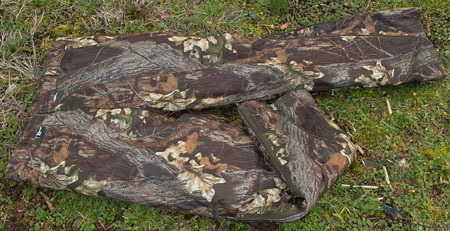 These are lined, insulated pants in the Mossy Oak Break-Up camo pattern. They incorporate belt loops, one rear pocket with hook and loop closure and two flannel-lined front slash pockets, zipper fly, and knee-length zippered legs with gussets. These pants are guaranteed to be waterproof, windproof, and breathable. YKK zippers are used throughout. The waterproof/breathable miracle is attained by use of Remington's exclusive Rem-Tech laminate material, which keeps the elements out, but allegedly "breathes" moisture buildup away from the body. All seams are taped for waterproofing. The insulation used in these pants is 170 grams of DuPont Thermolite Plus. This is a three part material consisting of an outer shell, the Thermolite Plus material, and an inner lining. Thermolite Plus is lightweight, supple, and less bulky than high loft insulations. An exclusive blend of fibers is said to trap more air for increased warmth. The outer shell is 100% Polyester, as is the lining and the padding. Remington sourced these pants from American Camper, a Brunswick Company; unfortunately, they are actually made in Red China. They can be machine washed in cold water with mild detergent, but must be line dried. They must not be dry cleaned. In the course of wearing these pants, I can attest to the fact that they are definitely warm. Since I was conducting this review in the middle of winter, it should have been cold. But, in fact, our cold spell dissipated before the pants arrived and early February in Western Oregon (where I live) was unseasonably warm, with daily highs around 49-50 degrees. The result being that when I was wearing the Stalker Hide insulated pants for this review, my legs were much too warm. Within minutes at our local outdoor rifle range, where I was testing rifles as well as pants, my legs were sweaty and the flannel front pockets were damp with perspiration. Thus I can vouch for their warmth, but not their "breathability." But, after all, these are advertised as cold weather pants and only a transplant from Tahiti would have considered it "cold" during my time with them. I am looking forward to wearing them during the upcoming Fall hunting season, however. These pants are, thankfully, reasonably quiet. They don't "shriek" with movement as do nylon pants. I rate them as suitable for hunting. Other than being much too warm for the prevailing conditions, which was not the pants' fault (blame the weather and pressing editorial deadlines), these Stalker Hide pants seem to be a good product. In fact, everything that I have reviewed from the Remington clothing line has been a good product. I certainly wish that I'd had these insulated pants for last year's Eastern Oregon elk hunt, where the morning temperatures were about 17 degrees. Waiting on stand for the sun to come up, I would have really appreciated these warm Remington Stalker Hide pants! Copyright 2007, 2016 by Chuck Hawks. All rights reserved.